What better a testing ground than a live press even and Essentialmac was lucky enough to be invited to such an occasion by Nuance, the makers of the Dragon Dictate range of speech recognition software. So armed with just an iPhone and the Tascam iM2 we thought what better a testing ground than an actual real life scenario where you need to be able to record audio quickly and easily. …the first of what becomes many problems and frustrations. At 1st glance this seemed a capable application, letting you said EQ limits, levels and a few other features like setting the equalizer to the input and swapping left in right stereo channels. Right here is one we see the 1st of what becomes many problems. By default the program records in mono and a simple tap of the button changes it to stereo. Like any normal person after making this change I go back to the home screen but it still says it’s recording in mono. this took some figuring out and it wasn’t until I tap the record button it actually changes the word Mono to stereo. Why? This, unfortunately, set the experience level for the rest of the time we use this application. The words”quickly” and “easily” are obviously not part of the developers vocabulary. There are a few interface eccentricities that you can easily forget, for example, pressing the record button doesn’t actually start the recording process it just arms the program ready for recording. To actually enable recording you have to press the record button a 2nd time. So at this point you would assume, just like the Apple voice memo application, you can record to your hearts content and then when you have finished simply press the record button again to stop recording. Not with the Tascam PCM recorder. If you have the gall to set your iPhone to lock your screen after a predetermined amount of time you will be punished for this. As, when your screen automatically locks, Tascam PCM recorder stops recording. Okay so I hold my hands up and think perhaps I should have pressed the lock button centered in the middle of the screen. So once again we press the record button, then the record button again, check that the levels are correct, and finally hit the lock button thinking obviously this blocks the application and stops the iPhone from locking the home screen. We assumed wrong. The lock button prevents you from accidentally touching the screen and stopping recording. Can you sense my level of frustration yet? This leaves us with one of 2 workarounds. Option 1 is that you change your iPhone’s autolock function to something different or never. Option 2 means keeping application alive which generally means using your phone or touching the screen. I’m not a designer but both of these options seem counter intuitive to how I would use any other iPhone application. Knowing I was likely to forget to reset the auto lock function on my iPhone I decided that I would tap the screen intermittently to keep the application awake. As I mentioned earlier you can’t listen back to recordings with the microphone plugged in so it wasn’t till I got home that I discovered that tapping the phone resulted in a massive thudding sound being recorded on every single recording. Which to be fair isn’t really the fault of the microphone as it’s only doing its job. Most decent microphones require some sort of noise dampener to sit on to reduce vibration. Even the simple task of listening to your recordings becomes a complete endeavour of perseverance. To listen to a recording you go back into settings, turn on the speaker, go back to the main screen, and press play. Even if you load a previously saved recording you still have to follow the steps to turn the speaker on. Surely if you load a recording you’d want to be up to hear it on your iPhone or am I missing something here? Why make it so hard to do the most basic tasks, add an option for default speaker playback or something similar perhaps? 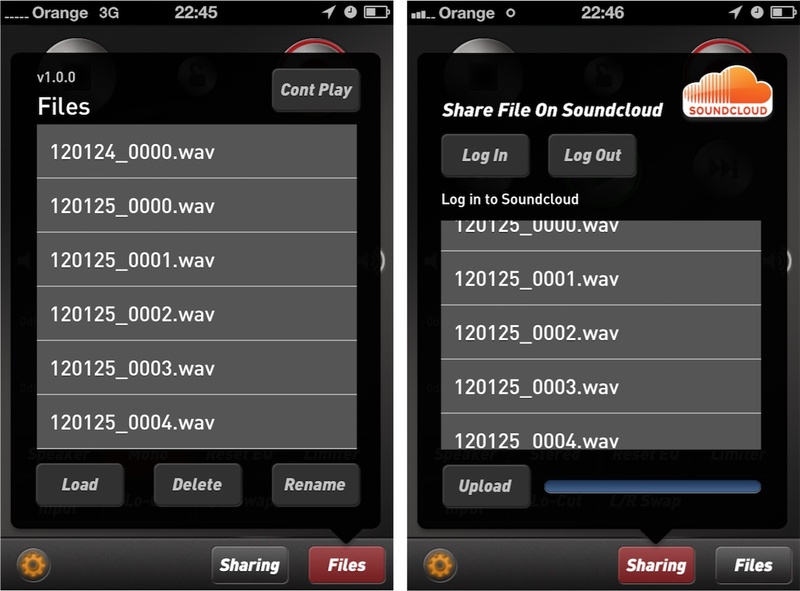 Accessing your recordings can be done either via iTunes or uploading to sound cloud. As sound cloud integration is baked into the application we decided to give that a try, thinking, how hard can it be to upload a file? It turns out incredibly hard. Below are just a couple of screenshots of the issues we had. Before anyone says that it was obviously our Internet connection, I popped down to our local university and use their 10 Mb upload connection just to make sure it wasn’t my connection timing out. Overall. Avoid like that special relative. All in all this application is a complete mess. Execution, implementation and usability it ranks 10 out of 10 on the shambolic scale. There is a special place on my hatred list for the person who was designed and tested and released this application. But what really, really pains me with a big companies such as Tascam was the lack of any technical support at all. The application may be free but the hardware that they recommend to use with this is on the higher end of the scale so you would think there would be at least some sort of support acknowledgement. As of today I’ve sent four e-mails and received one back asking me to contact the UK Department. 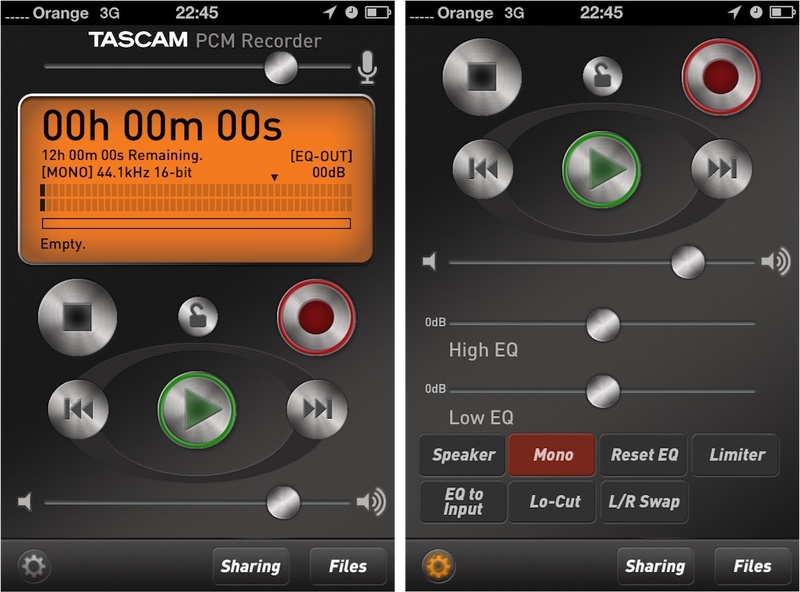 Overall the Tascam hardware is sound and more than capable of delivering clear, concise recordings with detail but I am recommending you avoid this app. After finishing this review I popped along to the App Store to see what other people are saying. Turns out I’m not the only one having all of these issues. How about if the application is still running you push a notification somehow to the front of the screen? If there isn’t an API for that send me an email, twitter or just SOMETHING that interacts with notification centre to put a message on screen. There’s still no fix for the playback “feature” so having to turn the speaker on to listen to something you’ve just recorded is still there. * New File name displayed in Rec-Ready, so you know what the next file will be (same as TASCAM DR handheld recorders). * The PCMRecorder App doesn’t disable the auto-lock timer while recording, because it could fill up your iOS device completely with audio If you need to do a long recording, please disable the auto-lock function first, or recording will stop when auto-lock engages. 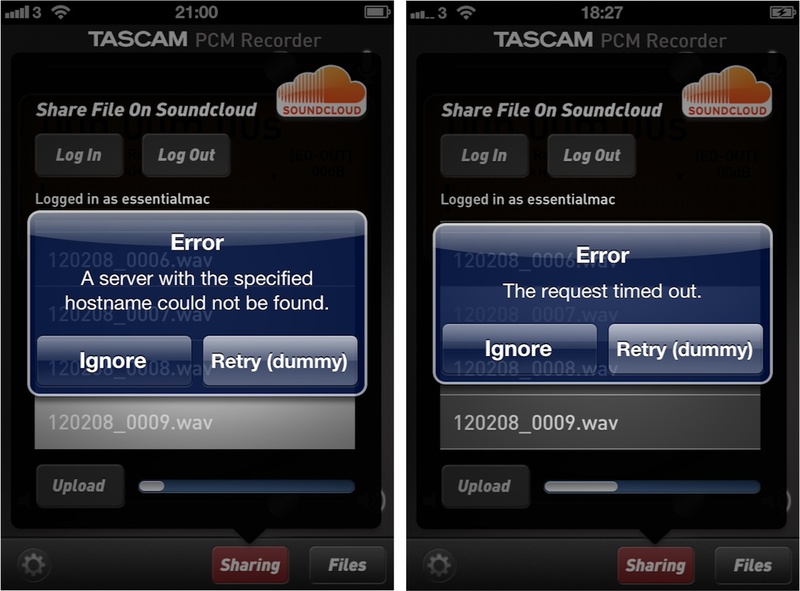 You can try to contact Tascam for support and if you get a response from them, unlike ourselves, please let us know. As always like with any review we publish, a copy has been sent to the developers for feedback.